This Garmin Instinct Review looks in some detail at Garmin’s latest outdoors and hiking watch. As we shall see, it is a sweet combination of practical outdoors features, a good price and a sensibly rugged exterior. Who buys a Garmin Instinct? The Instinct has good outdoors functionality for hiking and fairly good sports functionality added in. The screen is somewhat limited in size/resolution but the accompanying Garmin EXPLORE app, Garmin Basecamp and Garmin Connect platformall boost the Instinct’s attractiveness as does the Instinct’s great battery life. Richer and perhaps more serious outdoors enthusiasts will favour the Garmin Fenix 5X Plus or the Suunto 9 BARO but these are not the direct competition. Really the competition might come from manual devices or hand-held navigation units or the direct competition of outdoors watches like the Suunto Spartan Trainer OUTDOOR, the Casio WSD-F30 or your smartphone-plus-an-app. But if you are an OUTDOORS ADVENTURER or HIKER looking for a watch offering these features: Barometric altimeter; GPS+Galileo/GLONASS; magnetic compass; multi-day battery; ability to follow breadcrumb routes and navigate to waypoints, then I don’t think you will find anything else at all at the same price point as the Instinct. If you want a device that can also properly track many sports to a recreational level then the Garmin is a winner there too. OK, the screen is small with a low resolution and there are not onboard maps but the Instinct IS a SWEET device as we shall see as I also cover some of the EXTRA goodies that I’ve not even mentioned yet. You get the watch and a USB charger. You know the drill. If you are new to Garmin then you will want to set up a Garmin CONNECT account via the app and you might want to also download the GARMIN EXPLORE app and Garmin Basecamp before you start off. Using the INSTICT is mostly intuitive but here is a link to the Garmin Instinct Manual if you need that to find some of the more hidden away features. The Instinct is good-to-go for most things straight out of the box. So you can use the compass or look at your elevation, record your hike or start a sport straight away. And if you are an existing Garmin user you will be able to put your existing knowledge of your current Garmin to good use to get off to a more customised quick start as the INSTINCT has a similar look and feel to other, recent Garmin devices. However if you are new to Garmin and looking to do more complex route creation and navigation then you’ll need a little bit more time and patience figuring how to do just that. It’ll be worth the investment of your time but I’ll need to explain routes and navigation in a bit more detail later. Similarly if you want to customise how the watch handles sports then you can, I’ll cover that here as well but not in as much detail as I normally would as this review is focussed more towards you Hikers and Outdoors Adventurers. Track Back over your route OR being pointed back to your start point. Missing from those lists is ROUTE CREATION, I’ll cover how you do that in EXPLORE or BASECAMP – there are other ways too. Within the NAVIGATE profile you can choose to ‘Sight and Go’. This effectively turns the INSTINCT display into a magnetic compass. Other outdoors and sports watches might have a GPS-based compass, which is OK, but the GPS-based compasses don’t always point in the right direction when stationary unless used in conjunction with an internal accelerometer. That can all get quite complicated and it must just be easier to have a magnetic compass like with the INSTINCT. You can calibrate the compass whenever you like and set NORTH to be true North, map North or magnetic North. If you choose TRUE North then I’m not entirely sure how that is determined without knowing how to set the compass declination. Declination is often only a couple of degrees so I guess it won’t make too much difference for most people, most of the time. The altimeter appears to be predominantly a barometric altimeter. I find these are generally pretty accurate over a couple of hours but beyond that changes in atmospheric pressure seem to often impact accuracy in the absence of re-calibration. A 3D-GPS fix normally takes a little longer than a 2D one when you start the watch, say at least 30 seconds longer. 3D GPS is disabled by default. I would imagine that 3D-GPS would find the GPS-derived starting altitude to a more accurate level than 2D? I could be wrong. If you are navigating to a waypoint created from EXPLORE then EXPLORE ‘knows’ the correct altitude but I’m not sure that the INSTINCT auto-re-calibrates the ELEVATION when it reaches that point? The Fenix 5 does, I think the INSTINCT does NOT do this. Some other vendors (Suunto) have a concept of FusedAlti whereby the elevation is corrected based on a periodic GPS-altitude reading. Again the INSTINCT appears not to do this and would benefit from it for those of you concerned about correct elevation. Having said all of that, if you are halfway up a vertical rock face in the Alps then I would imagine that most GPS watches will find it extremely difficult to get a correct GPS-derived elevation (ie its impossible) so the barometrically derived value is likely to be the most correct in the more extreme scenarios where precision might be especially useful. Navigating electronically via waypoints is probably the next step up from using a paper map. To do this you will normally have determined the points you want to navigate to before you start out and sync’d them to your INSTINCT. As you navigate, your INSTINCT points you in the right direction to the next waypoint. That’s kinda OK, but there might be a lake in the way. If used in conjunction with a real map then this can be a fun way of getting from A to B. One of the great things with the INSTINCT and it’s link to the Garmin EXPLORE app on your smartphone is that you can use the ‘real’ map on the EXPLORE app to set new waypoints and then sync them to your INSTINCT for a more refined navigational experience. REMEMBER: any route on your GARMIN INSTINCT is merely a directional or breadcrumb trail of multiple points. If you go off track when following the route, the GARMIN INSTINCT DOES NOT have any map-based intelligence to route you back sensibly to your course. It is NOT like your car’s SATNAV in that respect. You can create your route in many ways, using many pieces of software. There may then be an easy or a convoluted game you have to play to get your GPX/TCX route file onto your Instinct via Garmin Connect. I can’t cover all those ways here, please feel free to add your favourite in the comments further below. One example is that you could upload a GPX route file from your desktop into Garmin Connect online and, from there, automatically sync it to the INSTINCT either via the cable or Connect app. Probably the easiest method of route creation is to stay within the Garmin ecosystem. Using the Garmin Connect app you have several route creation options. Here is one where I chose the start point for a 5km round trip in the UK’s Peak District. I told Garmin Connect to start off to the North and it automatically created the round trip route of the required distance. I later added a few waypoints and double-checked the image by switching to satellite view – all was good. Creating, adding points and syncing this impromptu, round-trip route easily took less than 5 minutes. Personally I would prefer to use Garmin Connect on the web instead of the Garmin Connect app. I like the finer control from using a mouse and being able to more easily drag a mid-point of the route to ‘somewhere else’ and have the course adjust accordingly. However, out-in-the-wilds that option is off-the-cards and so it is good to have the fall back position of the Garmin Connect app to fall back to. Route creation within the Garmin ecosystem can use their proprietary POPULARITY ROUTING which is based on a large database of previous journeys by other users. If you are planning a hike on a well-trodden path then most of you will be good-to-go here. You can see on the 4th image, further above, the ‘+’ and ‘-‘ signs. The INSTINCT DOES let you move around the map and zoom in/out. If you have chosen to record a WALK ‘ACTIVITY PROFILE’ on your INSTINCT then you effectively attach the COURSE via the WALK’s NAVIGATION/COURSE settings. It is a little confusing but many vendors follow that same principle. You can configure the WALK sport in many ways to, for example, include metrics like SPEED, ELEVATION, VERTICAL SPEED, ETA and so on. It looks to me like just about every common metric is included for walking/hiking. Instinct lacks premium case materials and interchangeable straps – although the INSTINCT is built to a tough, military standard of durability. The Garmin Explore app is free and does NOT require any Garmin watch. It comes with free, detailed maps and satellite imagery. If you like it’s the app-equivalent of a paper map and compass. The Garmin Explore app is NOT like your SATNAV. It only understands GPS points and does not have any understanding of roads or trails so, just like with a paper map, you have to work out a new route yourself. Explore does, however, store waypoints so you can get a bearing and proceed towards it accordingly. It provides the link to get navigational stuff onto the INSTINCT whilst on the move. You can then organise these by ‘collections’. So, for example, you could have a series of tracks that you might follow for your HOLIDAY2021 collection or you might organise 50 waypoints together that are in your local national park. That sort of thing. 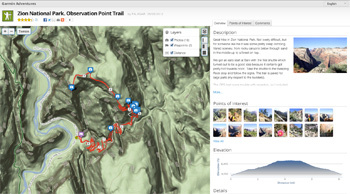 Garmin Base Camp is computer-based software similar in functionality to the Explore app. It’s old software but still useful. One big difference to the Explore app is that BASECAMP *DOES* contain routing intelligence. Thus you can choose 2 points and BASECAMP will give you turn-by-turn instructions to get from one to the other unlike EXPLORE which would only give you a bearing (straight line). The big downside to BASECAMP is that you do not have it in a portable app format and much of the same routing and mapping functionality is now also available in Garmin Connect which, as we’ve seen, does work on the smartphone app. Much of the rest of this site dwells on sports usage, I won’t do that here. If you have any specific questions then please ask below in the comments. The INSTINCT is a nicely competent sporty device intended for the casual athlete. I’ve used the Garmin INSTINCT a fair bit for running and swimming, although not as much as I would have liked. It’s perfectly OK to use with a nicely readable screen. It’s a little bulky and compensates for that by being super lightweight. On the other hand it’s not so great for cycling where I didn’t get on with it too well because of the smaller screen format. But if you are using the INSTINCT simply to log your trail rides then it’s perfectly fine, I just found that I liked a bit more cycling sensor data on the screen and the INSTINCT couldn’t deliver there. That’s just me though…I know I need a sports watch really! You can check out the detailed specs later and the accuracy of use for each sport but, for now, I will briefly cover a few sports and highlight some features (or lack of) that stood out for me. Perhaps most noteworthy is the battery life of 40 hours in ULTRATRAC battery mode. This cuts back on the frequency of GPS points taken and save power that way. It’s thus a great, rugged watch for you UltraRunners and fell runners as long as you don’t mind a less-than-perfect GPS track at the end for your logs. A run-walk mode is available as are other handy in-run features like laps, autolap, alerts and calories. I specifically liked the ‘proximity alert‘ where, for example, the INSTINCT can tell me if I am 600m away from a give WAYPOINT. Also useful is the ability to invert the screen ‘colours’ either for personal preferences or when there are unusual light conditions. You can follow predefined and complex workouts that you create on Garmin Connect or create a simple interval workout, with repeats, on-the-fly. As already noted the Instinct is too small a watch format to use as you ride. The beeps and vibrations are good to draw your attention to the INSTINCT when traversing a ridden trail, however it’s hard to see anything much more useful that following a bearing as you bounce along. Of course if you periodically stop then it becomes as useful as it is when running/hiking and you can take the time SAFELY to dwell on what the INSTINCT is telling you. I would feel more confident taking the INSTINCT on some trail rides than other expensive watches. The INSTINCT is rugged and durable and I would not be too concerned if it got the occasional knock. Most casual athletes will be pleasantly surprised by the breadth and depth of features offered by the INSTINCT. But f you’re a triathlete with a power meter going for those STRAVA segments then you will be disappointed. Q: Just how good are the techy ‘bits’ in the Instinct? How accurate are the GPS, the Elevation and the Heart Rate ? The brief answer to those questions are that those areas are all sufficiently accurate for an Outdoors Adventurer who might also be a recreational athlete. If, for example, you consider yourself to be an athlete or extreme adventurer who needs high levels of accuracy then read the following sections and see what you think. The Garmin ELEVATE oHR sensor used in the INSTINCT has been employed on most Garmin watches for a couple of years now but is being replaced with a modified one on new models from 2019 onwards. oHR performance on the wrist is perfect for some and awful for others. It depends on your physiology. Take some comfort that at resting levels and at walking/hiking levels of exertion all should be good for nearly everyone. But in more active sport you may or may not be lucky. Here is a 2x20minute turbo bike ride @90%FTP (! ), which for the uninitiated is a relatively hard effort but the bike is stationary so there are few vibrations that might lead to bad results. Indeed you can see that the Instinct is good enough here. Here is my HR bouncing around as I bounce around the bumpy rounds of Surrey on a bike. The ELEVATE sensor on the INSTINCT is not good enough for my purposes but I would suspect that the buyer of an INSTINCT will find this performance perfectly acceptable for most cycling purposes. You will be lucky if you get a oHR track as good as this for a more serious trail ride. Here I am running not very fast at all on a treadmill and the INSTINCT is perfectly fine despite the odd mini-moment of fun. I repeated this same run session outside on real roads and got similar results. The INSTINCT is pretty good here but has a few VERY MINOR wobblies. This is certainly a good enough oHR performance for me…unlike the mystery ‘X’ device. The INSTINCT can’t record any HR whilst swimming as Garmin have not enabled oHR underwater on any of their devices and the INSTINCT does not support a caching HR strap which would be the only other alternative. HR Summary: The INSTINCT can deliver good HR performance but ‘it depends’ on many factors, quite a few of which are out of your control. You can always use a chest strap if you want accuracy. At a high level you will see that most GPS tracks look very similar and here is the INSTINCT (red – hardly visible) matching a WAHOO device to an apparently good level of accuracy. Looking in more detail you will find discrepancies between tracks as shown in the following image. But GPS is only accurate to about 5m so you would expect this level of performance as each device could be 5m inaccurate in a different direction. However I’ve used GPS+GALILEO on the INSTINCT so you might expect better results. But the further realities are that GPS/GLONASS/GALILEO are impacted by trees, buildings and several other factors. These are 3 ‘events’ from a 100km ride. These were my only concerns with what was recorded, ie trivial events in the grand scheme of things. The first image is zoomed in from the larger image above where you can see a glitch in the Instinct’s track. Perhaps not a problem. But then the two subsequent images are when stationary, the first for a coffee stop in Shere and the second waiting for someone to catch up. The GPS+Galileo track is clearly moving about quite a lot. I don’t really have an issue with this for a pause in a cycle ride but it does not bode well for navigating when hiking if the track jumps around this much at slow speeds. Here I am jogging along part of the Bushy Park parkrun course and the track is followed surprisingly perfectly. There are no GPS obstructions apart from the occasional tree. As the INSINCT is more of a rural watch I decidied to do a GRID-based urban run…#sigh. Actually it’s a good test to see if corners are cut…which they weren’t…and the INSTINCT is perhaps the better of the three. I’ve only had about 20 hours of use with the INSTINCT in sports activities so far and I haven’t yet quite made up my mind on the INSTINCT’s overall GPS performance, partly because I’ve not also managed to do my formal test on a 10 mile running route with it. However the fact that I haven’t come to a definitive conclusion yet means it doesn’t seem to differ from the performances of previous, recent Garmins. So it’s going to be an ‘ACCEPTABLE to GOOD’ level of performance. I was hoping that the non-metallic case might IMPROVE GPS performance but I’ve seen no evidence of that so far. The image below shows the ‘correct’ elevation profile vs that from the Instinct which had 3D-GPS (+GALILEO) enabled and autocalibration of the altimeter also enabled. Instinct auto-calibrates when it gets a GPS fix at the start of your activity. As you can see, the Instinct seems to track the actual elevation profile pretty well but the Instinct recorded ascent=508m (correct=727m, Wahoo=737m) vs descent=478m (correct=600m, Wahoo=702m) – which is not as good as it looks on the chart. If you are looking for critical elevation accuracy then I suspect you might need a higher-end device and/or undertake some further research. See Garmin Fenix 5X Plus or Suunto 9 BARO. The unusual bits of functionality on the Instinct number one item which is probably best summed up as “it has a funny little screen-in-screen thing going on”. Take a look at the image to the right. The little screen does seem to give you a useful highlight of where you are in the menu system or, perhaps, a focus on a some key even like the compass heading or GPS status. However I’m not convinced that it offers something that another data field could not do and it does seem to waste a bit of screen real estate on what is already a small screen. It can be configured but I’d rather just have a normal screen. There are lots more things I haven’t covered here in the review – so I’ve added a link below to some of themore vouminous stuff that not everyone is interestedin. Garmin has so many features that are standard across many models. For example the Instinct is a complete activity tracker giving you steps, sleep, 24×7 HR and abnormal HR alerts. Even mentioning those areas, Garmin adds further elements of functionality behind those headlines. One particular thing worth pointing out is the ability to get decent sounds and vibrations from alerts and key presses. INSTINCT has a readable, monochrome display at 128 x 128 pixels. It’s a lightweight case at 53g measuring 45 x 45 x 15.3 mm and is good for waterproofing to 10ATM/100M. Battery modes are from 16 hours to 14 days – You could probably get 3-4 days of usage out of it using the right modes but if you’re going away for a week then take a charger. I don’t know Garmin’s sales figures for the Instinct but I suspect it will be a surprising success for them. The INSTINCT somewhat fills a gap in the market and at a nice price. I suspect that the gadget market for hiking is modest in size but will grow as products like this target an increasingly sophisticated part of the market buoyed by lots of youngsters keen to gain outdoors’ experiences without straying too far from their smartphone. I suspect the reasons why you’ll like it are the reasons why others will too. It’s a light and well-made device, apparently to Military standards of durability. I’ve thrown mine down the stairs a few times and it still works fine. I don’t especailly like the looks of the Instinct and prefer something more refined like a higher-end Suunto but for those of you who like the rugged Casio-esque look then you will love the INSTINCT. If it had a slightly bigger screen with slightly better resolution I’d probably like it more. But that one innovation might probably then adversely impact on the very good battery life. And that’s one of the key aspects of the Instinct. It’s got enough juice in the tank to keep you going for a couple of days if you sensibly manage your GPS-time. The Instinct does not support wither Garmin PAY or Garmin’s CIQ apps. I suspect the former is a result of the hardware and the latter exclusion to stop you straying too far from Garmin’s own ecosystem. The Instinct also lacks onboard maps. But then so does most of the competition and effectively ALL of the direct competition at this price. The mapping intelligence in the Explore & Connect apps coupled with the outdoors sensors on the device is a winning combination. Whilst I’m not a frequent hiker, I can see the Instinct hitting the spot by providing a complete hiking/adventure solution for most people. You can use it as a smart sports watch too with many of Garmin great sporting & connected smart features throughout the Connect ecosystem but don’t expect it to do high-end and fancy sporty stuff like supporting power meters for a triathlon. HIGHLIGHT: The best spec at this price. The INSTINCT is widely available at the price points shown and if you buy with the link to your local Amazon, below, then you get a great price and help this blog. Thank you!